Sourcing ingredients and raw materials is no longer enough. In a marketplace where manufacturers and consumers demand quality and assurance, provenance is key. 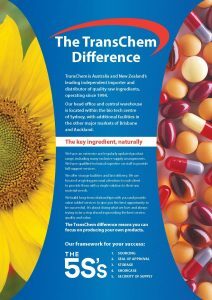 The mission statement of the leading independent importer and distributor of high-quality raw ingredients into Australia and New Zealand, TransChem, focuses on the simple fundamentals of guaranteeing the secure and reliable supply of innovative, highest quality materials to give its clients the edge. Click to read more about the TransChem difference and to be able to download the brochure. With networks worldwide and proven sourcing techniques, TransChem is supplying quality raw materials for products as diverse as pharmaceutical actives, complementary medicines, food and beverage, and stockfeed items to Australia’s manufacturing doorstep. TransChem proactively supports its clients’ business success by developing deep, long-term client relationships with expertly sourced and reliably supplied, quality raw materials at competitive prices. TransChem also specialises in sourcing innovative functional ingredients, involving unique and patented processes, which then act as differentiators for their clients’ finished products. Intuitive recognition of market needs stimulates the sourcing of relevant ingredients. Many items in TransChem’s ingredient range are under exclusive supply arrangement, delivering TransChem clients an immediate market advantage. Ultimately, it’s a thorough understanding of what the market needs, driven by actively listening to the details of what customers are working on in their new product development programs that drives TransChem’s international sourcing efforts. No matter how remote the location or how specific or unique the ingredient, TransChem’s global network will track it down; from active pharma ingredients in Germany, to flavours from Slovenia or yam extracts from Ecuador, with contacts spanning Europe and the USA, TransChem’s network will pinpoint them on the map. Certainty about the chain-of-integrity and quality of ingredients from farm to finished product is an integral TransChem value and a significant point of difference in the market. Customers can rely on TransChem to provide only the very best quality ingredients from the most reliable overseas suppliers. It’s an enviable reputation built on decades of careful and methodical attention to detail. At TransChem, it’s the little things that count. TransChem guarantees the traceability and quality assurance of the ingredients it supplies by diligently implementing ‘vendor assurance questionnaires’ which strictly apply the Australian Self Medication Industry (ASMI) standards. These questionnaire protocols are the product of collaboration between the Complementary Medicine Association of Australia (CMA) and ASMI to ensure strict standards apply to the vendor qualification of suppliers of raw material ingredients for the manufacture of medicinal products. While the responsibility for guaranteeing ingredient relevance and reliability rests with the client, TransChem actively assists clients by providing technical support along with the appropriate supporting documentation. This attention to detail and early stage support is a point of difference TransChem is proud of; caring, service and knowledge are all key TransChem values. Time is of the essence in TransChem’s supplier relationships and this not only relates to the timely delivery of materials; time is invested with newly recruited suppliers during face-to-face meetings, particularly at international trade fairs. Interviews and in-depth discussions with potential new suppliers at these forums are informed by decades of experience, honed to reveal the background stories of suppliers, their view of themselves in their own words, and to weed out short-cuts and unreliability of supply. TransChem has more than 30 global partners providing a network of contacts and advisers who have worked exclusively alongside them for more than 20 years. These are major partners and include well-known global brands from Switzerland, Italy, Japan, USA, Netherlands, Canada, Taiwan and South Korea, as well as some of the highest quality and established suppliers from both China and India. TransChem’s point of difference here is simple; such longstanding relationships are predicated on absolute trust in the quality of process and ingredient from farm to finished product. The integrity and quality of a product can only survive if its existence and performance is real and sustainable, and TransChem strives to maintain the longevity of its global partner relationships. TransChem works exclusively with verified international experts. Numerous suppliers have approached TransChem over the years but only those with the discipline and integrity of process required get through to first base. Stringent evaluation criteria, vendor qualification processes and compliance assessments ensure only the best suppliers are selected. Technical verification checks are performed by TransChem, ensuring clients’ peace of mind that they are using not only a high quality ingredient, but that it is from a verified, reliable and trusted source. Valuing and maintaining close client relationships is a critical element of TransChem’s business, particularly when it comes to sourcing ingredients. This collaborative approach means being well informed about new product development, studying core trends within various consumer segments, knowing the requirements of the export markets served by clients and understanding which new ingredients and their associated functionalities are working in which overseas markets. This deep understanding of the market drives the company’s global search for increasingly innovative raw materials and to source the highest quality ingredients from the most reliable overseas suppliers.